FIGURE 1. 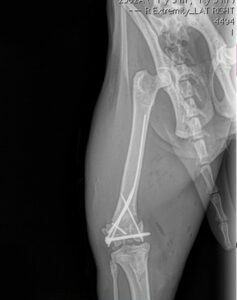 Example of IM pin and cerclage wire for fixation of a long oblique tibial fracture in an immature dog. Part 2 discussing selection of fixation technique, external coaptation, identification of bone healing, and potential complications. Cannot be reduced appropriately (see The 50/50 Rule). The 50/50 rule states that fracture ends should have at least 50% contact to expect fracture healing, and that 50% reduction (contact) is the absolute minimum for bone healing to be possible, not probable. If the fracture cannot be reduced at least 50%, some type of internal fixation should be pursued. 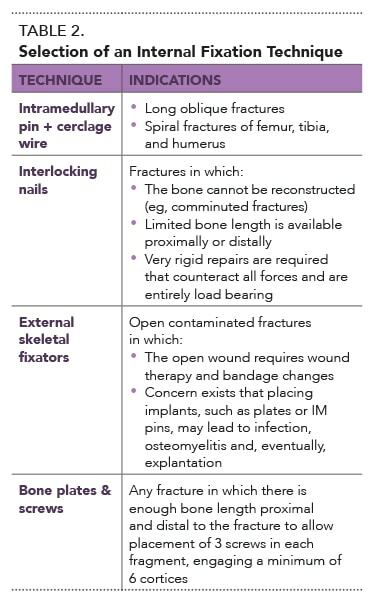 Choice of internal fixation method is based on fracture classification, affected bone, concurrent injuries, open versus closed and, of course, the forces being counteracted by the fixation method (Table 2). In addition, consider the ability, or inability, to reconstruct the cylinder of the bone, which affects the choice of fixation type and, ultimately, determines whether the bone can share in load bearing during healing or whether load bearing is done entirely by the implant until healing has occurred. IM pin (and/or K-wire) and cerclage wire is probably one of the more common fracture fixation methods used in general practice. While cerclage wires are typically considered a method of ancillary fixation commonly used with IM pins, they can also be used with ESFs, ILNs, and bone plates. IM pins resist bending loads well, but are poor at resisting rotational forces. For this reason, cerclage wires should always be added to IM pin fixation to help counteract axial and rotational forces. Cerclage wires also provide interfragmentary compression without damaging the blood supply or interfering with healing (unless they become loose). IM pins and cerclage wire fixation is limited to long oblique fractures and spiral fractures of the femur, tibia (Figure 1), and humerus. Pin migration or implant failure. Place IM pins into the medullary cavity of long bones (femur, tibia, or humerus) with either a drill or Jacobs chuck. Insert the pin in either a normograde or retrograde fashion to avoid joint surfaces. With this method of fixation, the IM pin should fill approximately 70% of the medullary cavity1: Measure the size of the canal on radiographs and select a pin that is 70% of the cavity or, alternatively, gauge size during surgery if the canal is exposed. Perpendicular to the bone shaft. The cerclage wires must be tight to provide adequate interfragmentary compression. Avoid the proximal articular surface and potential damage to the insertion of the cranial cruciate ligament; cerclage wire is also difficult to use around the tibia due to its triangular shape, which prevents placing appropriately tight cerclage. Never place IM pins into the radius due to high likelihood of joint penetration into the carpus or articular surface of the radial head. The most common pointed ends for IM pins are 3-sided trocar tips or 2-sided chisel tips: trocar tips are better suited for penetration of cortical bone, while chisel tips can be braced against the endosteal surface of the bone’s cortex or lodged in cancellous bone.2 Some IM pins may be partially threaded; however, when placed in the medullary cavity, partially threaded IM pins do not have any better holding power than standard smooth threaded pins (see Cautions). Giant breed dogs: 16 gauge. An ILN is similar to an IM pin, but is secured to the bone by bolts or screws that are placed proximal and distal to the fracture, passing through pre-existing holes in the nail. ILNs are similar to IM pins with regard to placement; however, they are superior for preventing rotational and shearing forces (due to the bolts/screws) and countering bending and compressive forces. ILNs are useful for fractures in which the bone cannot be reconstructed, such as highly comminuted fractures. This fixation method typically results in very rigid repairs that can counteract all forces and are entirely load bearing until bone healing has progressed to callus formation. ILNs are also helpful when limited bone length is available proximally or distally, as their corresponding bolts do not require much available bone length for placement. Benefits of ILNs include placement with a minimally invasive technique, allowing the fracture hematoma to remain untouched. This principle of minimal disruption at the fracture site allows for healing to progress undisturbed, optimizing the biological environment for healing. However, some of the same limitations seen with IM pin placement must be considered when placing ILNs: the articular surface must be carefully avoided during placement; thus, placement in the radius is not advisable and, while placement in the tibia is possible, it is slightly more challenging. ILNs are locked in place with bolts or screws that penetrate the cortex and thread through pre-existing holes at the proximal and distal aspects of the nail. Depending on nail type and number of holes distally and proximally, the number of screws or bolts placed varies. During surgical placement, a jig must be used to ensure that the bolts appropriately line up with the holes in the nail. Linear ESF configurations can be classified based on pin and rod placement, including the number of planes the pins pass through in space, and how many skin surfaces are penetrated (Table 3). Pins should be positive profile pins—those with threads rolled onto the core diameter of the pin, creating an inner diameter of the threaded region equal to the shaft diameter and eliminating a stress riser effect. Avoid negative profile pins—in which the thread is machine cut into the pin shaft creating an inner diameter of the threaded region smaller than the shaft diameter—due to their considerable weakness at the pin thread interface. Avoid smooth pins—those with no threads—which have considerably less holding power. If smooth pins must be used, they should be angled at least 70° to the bone to improve holding power. FIGURE 3. 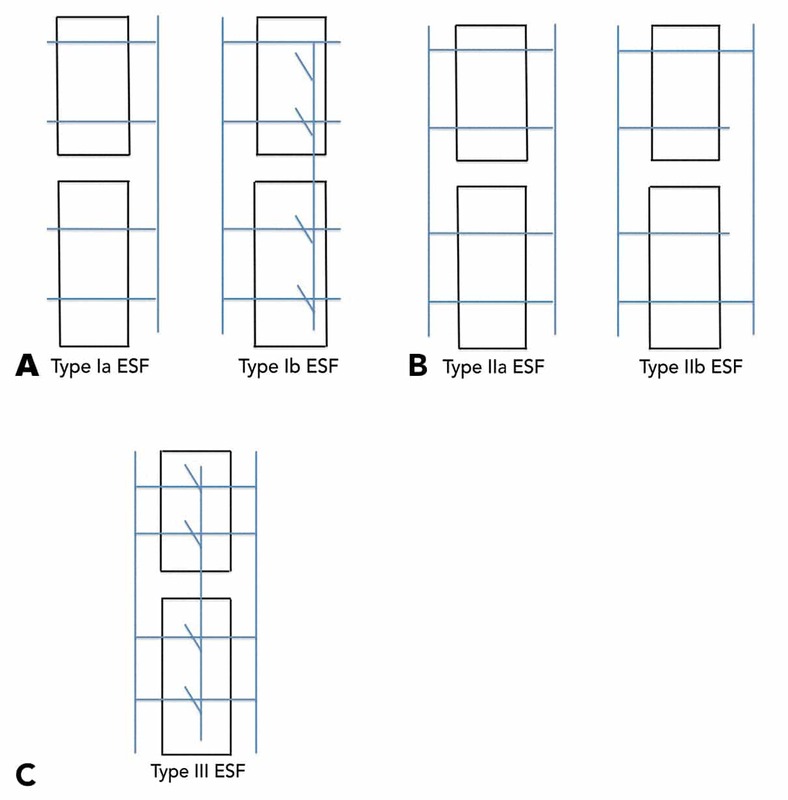 ESF classification: Differences between Types Ia and Ib (A) and Types IIa and IIb (B), and depiction of Type III (C). 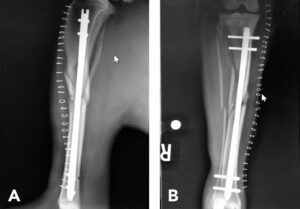 External skeletal fixation involves transcutaneous placement of threaded pins or wires into fracture fragments; these pins or wires are then stabilized externally with clamps and rods or epoxy. Linear external fixators are created by using transfixation pins or K-wires that are attached to a linear connecting bar using a clamp (Figure 3). Circular external fixators or ring external fixators allow the wires to engage the bone, with full or partial ring structure support, which consequently allows engagement of the bone circumferentially. 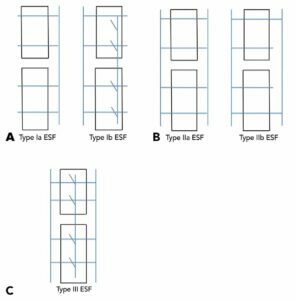 This type of ESF can be very useful when available bone fragment size is small or short in length. 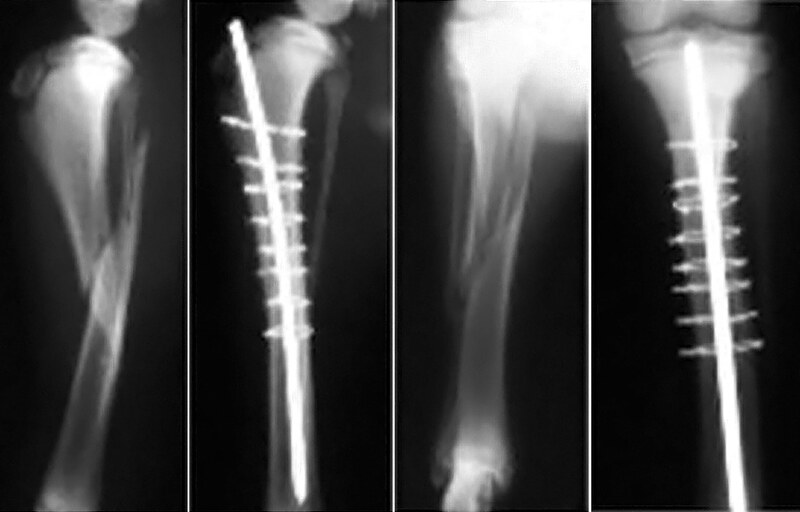 Hybrid fixators can be created by combining ring and linear fixator components and are used to address, for example, distal tibial fractures or angular limb deformity of the distal tibia (Figure 4). FIGURE 4. 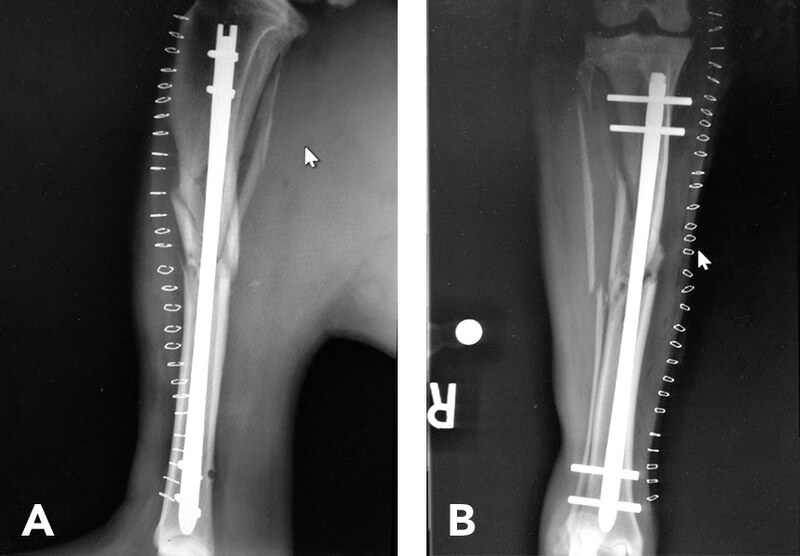 Example of a hybrid external fixator to correct a distal angular limb deformity; note the proximal pins and their attachment to a connecting bar via clamps. The connecting bar is tied into a circular ring with wires distally. 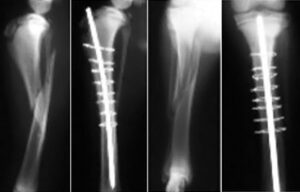 External skeletal fixation is diverse in its use and can be applied in a variety of fracture scenarios. It is an especially useful technique in patients with open contaminated fractures in which the open wound over the fracture requires local wound therapy and bandage changes. Another reason external skeletal fixation is often chosen to treat open fractures (and eventually removed altogether once the fracture has healed) is due to concern that placing implants, such as plates or IM pins, in a contaminated fracture may lead to infection of the implant and osteomyelitis, with eventual need for explantation. A benefit of ESFs is the ability to segmentally destabilize them over time as the fracture begins to heal, allowing more load bearing by the bone itself in a slow, controlled manner. Once the fracture has been assessed by radiographs and determined completely healed, the construct is removed entirely. However, caring for ESFs can be challenging for owners because the constructs are often bulky and may damage furniture or get caught on household items. Regardless of construct, an ESF requires placement of at least 2 pins proximally and 2 pins distally. However, it is ideal to place at least 3 pins proximally and 3 pins distally, engaging a total of 6 cortices on either side of the fracture.3 See Orthopedic Hardware: Linear ESF for further details on using linear ESFs. Since constructs can damage, or get caught on, household items, the ESF frame should be bandaged, which requires rechecks every 7 to 10 days to evaluate the frame and change the bandage. In addition, while the implants are in place, during each recheck the skin–pin interface should be monitored and cleaned regularly to prevent superficial infections or draining tracts. A bone plate used in a buttressing fashion is designed for metaphyseal fractures to prevent collapse of the area adjacent to an articular surface due to compressive forces. A plate used in a bridging fashion (in old terminology used interchangeably with buttressing) is designed to act as an internal splint to maintain the correct length and normal axial alignment when fracture ends cannot be anatomically reconstructed. More simply, this placement bridges the fracture site to hold the bones in reduction and alignment, allowing the bone to heal. FIGURE 5. Lateral (A) and craniocaudal (B) radiographs of right mid-diaphyseal femoral fracture stabilized with a locking plate and IM pin (plate/rod combination). Bone plates can be used for almost any fracture type if there is enough bone length proximal and distal to the fracture to allow for placement of 3 screws in each fragment, engaging a minimum of 6 cortices. This general rule can be used to determine the length and type of plate that should be applied in any given situation. Bone plates (see Orthopedic Hardware: Bone Plates & Screws) can be placed in bridging, buttressing, or compressing fashion, depending on the fracture type. Bridging and buttressing fashion: Used for fractures that cannot be readily reconstructed or for long bone fractures in which the length of bone must be restored and maintained in the face of comminution and bone loss. Compressing fashion: Used when the bony column can be reconstructed and the ends of the fracture fragment can be compressed together, which allows the bone to share in load bearing during the healing process. The near (cis) cortex is drilled to the same diameter of the screw threads (glide hole), while the far (trans) cortex is drilled slightly smaller than the core diameter of the screw. As the screw is tightened, it effectively draws the far fragment toward the near fragment, applying compression across the fracture gap. For example, to place a 3.5-mm lag screw, the cis cortex is drilled with a 3.5-mm drill bit, while the trans cortex is drilled with a 2.5-mm drill bit. FIGURE 6. Craniocaudal radiograph illustrating use of a lag screw for a condylar fracture in the femoral condyle of a cat; note there is also cross pin fixation to address additional comminuted aspects of the fracture. A screw used in a neutral fashion (also known as a plate screw) is placed in the center of the screw hole only to hold the plate in place. A screw used in a compression fashion allows movement of the bone fragment relative to the plate as it is tightened, leading to compression of the fracture. Screw holes in compression plates have an oval shape (rather than the round shape seen in noncompression plates) that allows the screw to be placed at one end of the oval. Part 2: Selection of Fixation Technique & External Coaptation (September/October 2015). Cancellous screws for metaphyseal bone: Designed to engage metaphyseal or epiphyseal bone, with larger outer diameter, deeper thread, and larger pitch. Locking plates, such as PAX plates (securos .com), ALPS plates (Kyon.ch), Synthes LCP (us.synthesvet.com), and string of pearls plates (orthomedinc.com) as well as others. With traditional plates, screws hold the plate in close contact with the bone, creating friction between the bone plate and bone and securing the construct. The axial load through the bone actually creates a shearing force at the screw–bone interface. Therefore, to minimize screw and plate failure, it is important that the plate be well contoured and fitted to the bone, with no soft tissue between the plate and bone. With locking plates, the screw heads thread into the plates, creating a locked fixed-angle system that behaves more like an ESF and does not require friction between the bone and plate. In addition, the axial force through the bone creates a compressive force at the screw–bone interface. Resolve need for perfect plate contouring and removal of soft tissue. Other specialized plates exist for use in specific anatomic regions, such as T-shaped plates for the proximal tibia or distal radius, L-shaped plates for the distal femur, and curved plates designed specifically for acetabular fractures. Johnston SA, von Pfeil DJF, Dejardin LM, et al. Internal fracture fixation. In Tobias KM, Johnston SA (eds): Veterinary Surgery, Small Animal, 1st ed. Philadelphia: Elsevier, 2012. Harasen G. Orthopedic hardware and equipment for the beginner: Part 1. Pins and wires. Can Vet J 2011; 52(9):1025-1026. Martinez SA, DeCamp CE. External skeletal fixation. In Tobias KM, Johnston SA. Veterinary Surgery, Small Animal, 1st ed. Philadelphia: Elsevier, 2012. Meredith Kapler, DVM, is a small animal surgical resident at North Carolina State University. She instructs veterinary students, and has presented at the Veterinary Orthopedic Society Conference and contributed to research articles and a book chapter. She received her DVM from University of Tennessee, completed a small animal internship at Virginia–Maryland Regional College of Veterinary Medicine, and completed an orthopedic research fellowship at University of Tennessee. Upon completing her residency, she will work as a staff surgeon at Veterinary Specialty Hospital of the Carolinas. David Dycus, DVM, MS, Diplomate ACVS (Small Animal), is a staff orthopedic surgeon at the Veterinary Orthopedic & Sports Medicine Group (VOSM) just outside Washington, D.C. He has presented at national meetings and has lectured second- through fourth-year veterinary students. He has published an array of research articles and a book chapter. Dr. Dycus received his DVM from Mississippi State University, completed a rotating internship at Auburn University, and completed an MS and small animal surgical residency at Mississippi State University. Get the latest peer-reviewed clinical resources delivered to your inbox.